A great prairie cartridge belt to display with a Sharps Rifle of .40 – .45 caliber or any other antique long arm chambered up to 45-70. The belt is an early, maker marked, civilian cartridge belt for .40 – .45 caliber rifle cartridges. It is marked “Flynn & Flynn, maker, Leon Springs, Texas”. Also, it is made in the same style as the early 1870’s military prairie belts, showing the same buckle mounted in the same manner. The cartridge web belt is kaki in color. Also, the belt is 3″ wide x 40″ long with 42 cartridge loops. Very good condition. Although, the belt does show some soiling from use. In addition, the original stitching is all present and good. Similarly, the leather chapes are in excellent shape. 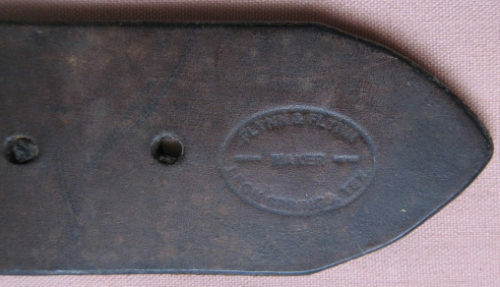 The back of the buckle is marked “USA” and shows a small anchor stamping. Also, on the backside, the buckle chape is marked “39. Furthermore, an illegible name is inked (and crossed out) on the back side of the webbing. Leon Springs is nineteen miles northwest of downtown San Antonio. The town began as a stage stop in 1846, operated by George von Pleve, a former German nobleman. In addition, for his service as a Texas Ranger, a german immigrant named Max Aue was awarded 640 acres at Leon Springs in 1852. Consequently, the Aue house/store became the first stop on the “Jaskass” stage route from San Antonio to San Diego, California. As a result, the community was thriving with a population of 50 by the mid 1880’s, along with a store and two hotels. Today the town is partially within the city limits of San Antonio and has a population of 137. However, most of the historic buildings are gone to subdivisions. I could not find listings or any information for Flynn & Flynn. Also I have never seen this maker mark before. Without a doubt, the style and hardware indicate to me that this belt was made when Leon Springs was still a frontier town. 45-70 & Winchester .405 cartridges in photos are not included.